Although hospice care is primarily provided in a p atient's or caregiver's home, there are some individuals who do not have a home environment appropriate for hospice care, or lack the family or friends necessary to provide 24/7 care in a home environment. Additionally, some hospice patients need around-the-clock medical attention during medication adjustments or for symptom management. In response to these needs, Niagara Hospice House was built. 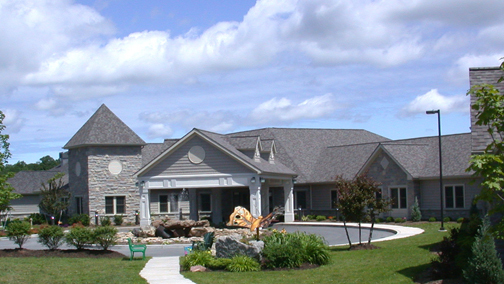 Niagara Hospice House is Niagara County's only residential hospice house, providing services to individuals with increased care giving needs or an insufficient caregiver system at home. The residential wing consists of ten suites specifically designed for patients who need residential hospice care. The general in-patient (GIP) wing has ten suites designed for patients needing short-term medical monitoring and symptom management. Each suite is designed with patient and family in mind with a sitting area and easy-chair sleeper. Each family also has access to gathering rooms, fireplaces, a chapel, kitchen and the Niagara Hospice Memorial Gardens and Pavilion. For more information about Niagara Hospice House, call Niagara Hospice at (716) 439-4417.